Most golfers swings are either too flat or too upright. Between those two points is your most powerful swing. And with Explanar that’s what you get. You get your optimum swing plane. When you swing on your optimum swing plane, you will be more accurate and much more powerful. 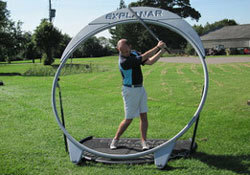 Explanar consists of 4 core components; The multi-adjustable Hoop, the Power Roller™, the Plane Fin™ and the Radial Stance Mat™. When combined they work unlike any other golf training aid. Many golfers have been significantly influenced in understanding the golf swing from Ben Hogan's Fundamentals of Golf.